2013 was a big year for renewable energy worldwide with 43.6% of new energy generating capacity being from renewables. This is despite a drop in investment for the second year running. Global Trends in Renewable Energy Investment 2014 is the latest annual report produced by the Frankfurt School-UNEP Collaborating Centre for Climate & Sustainable Energy Finance, the United Nations Environment Programme (UNEP) and Bloomberg New Energy Finance. It reports an investment drop of $35.1 billion caused by the falling cost of solar photovoltaic systems combined with policy uncertainty in many countries (an issue that also depressed investment in fossil fuel generation in 2013). A drop in investment would seem like very bad news but if it’s a cloud, there are some serious silver linings. 2013 saw a record amount of solar PV capacity installed. 39GW of solar capacity was installed in 2013 and sharply reduced PV costs meant that this record amount of capacity actually cost less than the 31GW installed in 2012. These drops in the cost of solar in particular are potentially hugely important. If you are wondering why governments invest in subsidies for solar PV and other technologies, this is why. They might be more expensive today but creating and maintaining a market for PV has allowed investment in the technology. Massive and continuing drops in cost mean we really can see a future where cheap, renewable energy is a viable and competitive option. I love this graph from Bloomberg, New Energy Finance. 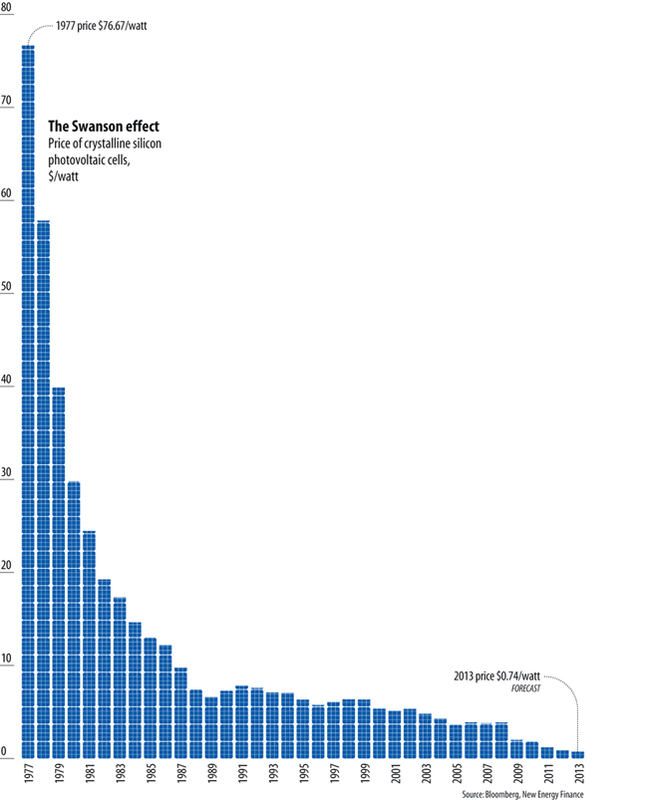 It just gives an idea of the massive scale of reduction in the cost of solar over the years. Between 2008 and 2012 solar PV module prices fell by 75%. When you add in last year’s huge price drops you can begin to see how solar panels can still remain a good investment. This entry was posted in Clean Energy, Green Business, Solar. Bookmark the permalink.